Appearance: At 23 years old & a college graduate, Ami is a very beautiful young woman. She has a very innocent & sweet expression, as she always keeps a smile on her face. She has short, dark blue hair & beautiful blue eyes. She'll wear a variety of clothing as she has a wide taste of fashion. But her normal outfits includes a long sleeved white shirt with a small blue vest & skirt. Personality: Everything about Ami is sweet, innocent & fragile. She is as sweet as any woman comes. She has a calm, sweet & loving nature which makes her so easy to get along with. She always shows she has an open heart for others & will often help them with whatever troubles they have. She is also a very independent woman, who strives to succeed & to do well in her work. She always enjoys the natural beauty of the outdoors & the world, which has gained her an interest in animals, plants & dinosaurs. 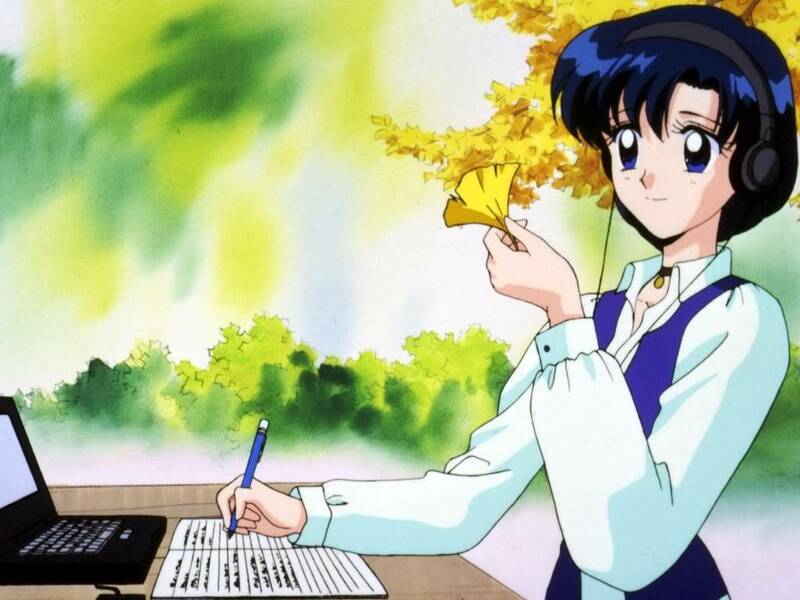 Biography: Born in an average family in Tokyo, Japan, young Ami Mizuno grew up in a descent life style. She was the only daughter of a happy family & had since grown a passion for animals & nature. Including dinosaurs. It was clear that Ami had a bright future ahead of her. She soon attended Elementary school & High school, where she did well in all her classes, making her the "book-warm" of the class. She was always smart in her studies & always took time to do her studies. But she was very kind & gentle towards others, & always offered to help. But she was always so shy around men who attracted her. Later, she would graduate as the valid-Victorian of her class, earning her many scholarships for several colleges. She soon began to begin her life in the universities, moving over to America to continue her studies in Biology, Paleontology, & a brand new Veterinarian course. Her love of animals & nature soon inspired her to work closely with animals & has traveled to many zoo's across the country. She even went on Safari trips in Africa & explorations in the Amazon. Wherever she went, she would always enjoy her work & her life as she strived to complete her goals. But soon, JFC had finally come into her life. As did the "Dinosaur Renaissance." Dinosaurs were being brought back to life & Ami was presented with an opportunity of a lifetime! She soon began to work in her new job as the new-assistant Veterinarian on John Hammond's Tournament island. There, she met her new & good friend Yoko Ritona, the head Vet. She also met Simon & Kamina, who always teased her & made her blush all the time. Ever since, she herself has worked closely with Yoko in the hatchery, tending to dinosaur eggs & newly born dinosaurs. She has also claimed her own ban of dinosaurs to gain some JFC experience. She now has a total of 8 months experience. Though she hasn't won a tournament yet, she hopes that when she does, she'll use the money for her & Yoko's work. But now, she is beginning to consider yet another job. This time- at the ever growing & popular Madeline Dinosaur National Park, where she will soon become Head Dinosaur Veterinarian.